Join Bodie, Rob, Morgan, and Johnny for their first podcast of 2017. Morgan returns from Hong Kong to have a great conversation and make some New Year resolutions. They talk soft spots, Bodie’s birthday weekend, and some weird news about Mitch Daniels. They discuss new workout plans, China’s lack of freedom of speech, and play a new quote game. Follow us on Twitter at @sleazypodcast and email us any questions, concerns, your resolutions, if your brain in fully developed, and how much you love breathing in air pollution to sleazypodcast@gmail.com. We are now available on iTunes, so please rate, review, and subscribe to our show! We appreciate your support. Thanks for listening! And as always, keep it sleazy. Join Bodie, Harry, Nick, Carley, and Matt for an unorthodox episode of KIS, just in time for the holidays. The gang talks about how much they miss Rob while showering him with compliments, they (almost) grant Nick’s birthday wish, and they even manage to speak upon the need for planting trees in Aleppo. Follow us on Twitter at @sleazypodcast and email us any questions, concerns, past birthday wishes that never came true, what you love about Rob, and your favorite world disaster of 2016 to sleazypodcast@gmail.com. We are now available on iTunes, so please rate, review, and subscribe to our show! We appreciate your support. Thanks for listening! And as always, keep it sleazy. Join Bodie, Rob, and Johnny for their first episode recorded in a Trump America. This is their first recorded episode in over a year, but the crew jumps back on the mics like Britney Spears after her 2007 meltdown. The crew talk Donald Trump and the 2016 presidential election, hot sauce, bust out some animal facts, and after much discussion, KIS gets an intern. 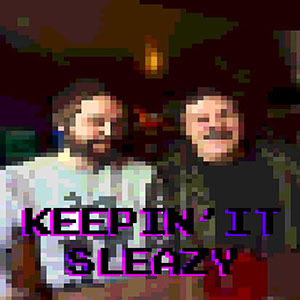 Follow us on Twitter at @sleazypodcast and email us any questions, concerns, who you voted for in the election, your favorite memories of Obama/Biden, and your plan to keep from going insane over the next four years to sleazypodcast@gmail.com. We are now available on iTunes, so please rate, review, and subscribe to our show! We appreciate your support. Thanks for listening! And as always, keep it sleazy.